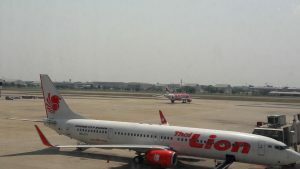 Aerothai president Somnuk Rongthong said on Monday that Airports of Thailand Plc would close a 200-metre-long section at the northern end of the airport’s western runway from Jan 29 to Feb 1. During this period the usable distance of the runway would shrink to 3,000 metres. As a result, the airport’s flight-handling capability would fall by about 10%, from 52 flights to 48 flights an hour. Flights would be delayed by 30-45 minutes during rush hours at the airport, and possibly longer if there were other negative factors such as bad weather or emergency runway damage, Mr Somnuk said. During the maintenance period, the western runway would be used only for departures, he said.